Also going by the name of the grey-blue shark, the mako shark is actually two species called the shortfin mako shark and longfin mako shark, the latter largely regarded as the rarer species. Both of these fish types can measure from eight feet to a whopping fourteen feet in length and they are able to weigh over 1,700 hefty pounds. The mako shark is related to the imposing great white shark. While it doesn’t cruise through the ocean as some of the top speeds of other fish that we’ve previously discussed, the mako shark is still able to reach up to forty miles per hour should it need to. Fascinatingly, it is unable to keep its buoyancy if it isn’t persistently swimming due to the mako shark’s lack of having a swim bladder. The shark is also recognized for its marvelous jumping ability, able to reach close to twenty feet into the air. The sharks can be recognized easily by its distinct colors which consist of a dark blue in the upper part of the body and a belly that’s white in color. Even when the mako shark has its mouth closed, the mako shark’s teeth are still on display. These teeth are sharply thin and long and slightly tilted. 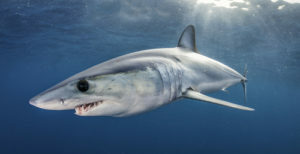 As carnivores, the mako shark’s diet consists of fish like tuna and mackerel, However, it has been known to clasp its jaws onto birds that may be too close to the water’s surface. If necessary, the mako shark will swim more than thirty miles each day to find the ideal meal. This update is by Free Spool Sport Fishing, a custom built 43’ Sports Fisherman Free Spool at Haulover Marina offering an exciting deep sea fishing experience for anyone including families, friends or business associates. Spearheaded by Miami native Captain Dennis Forgione. We fish for many different species of fish and we specialize in kite fishing for sailfish and mahi, live bait fishing for kingfish and other game fish. For more information on sport fishing Miami or to book a charter fishing Miami trip, please call 305-582-5445.